Wanna know what’s been keeping me so busy lately? Well yes, three kids but I’ve also been getting into making jewellery. In the next few weeks, I will be showing you what I’ve been up to! This is one of my latest pieces. I made this for my autistic son’s respite worker. She’s leaving for three month’s to go to Australia and her work also asks her to bling it up since it’s a nice place so this works for both. It uses headpins (a silver wire with a flat end on it which acts as a stopper) which I strung Swarovski round and bicone crystals in blue, teal and white then turned a 3/4 loop with round nose pliers and slipped the loop over the chain. Then I completed the loop and wrapped the wire tail around the wire stem just above the beads. I cut the chain to size, added a clasp to the chain and that’s it! The earrings are even easier. Add the beads to the headpin, wrap the loop. Add the earring wire. That’s it. It you are working with thicker wire than I am, you can just turn a loop and not even wrap it! Planning the beads so they hang nicely, look good and keep them in order while making the was the harder than the construction. I wish I’d planned the second and third in from each end a little better as they don’t lay well. The other’s just don’t have support behind them in the photo to lay perfectly but the end ones just sit funny because they don’t have room. Oh well. The earrings aren’t as interesting (I don’t like crazy earrings) but I did use a long French wire, (heck I don’t know what they are really called but that’s what I call em) so that makes them a bit more unique. When I asked our worker what style she likes or what preferences she has all I got was “I’m sure I’ll like anything you will make. Whatever you’d like to make.’” and “blue” so I think I’m good! 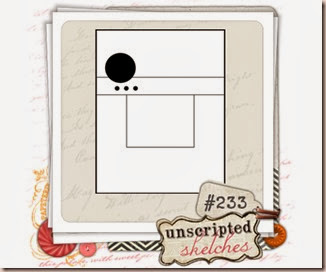 I decided to make a shaker card for this week’s Unscripted Sketches. It’s always fun to make something beyond a basic card! In the shaker box I added white glitter, tinsel glitter and microbeads. Microbeads are idea because they heavy enough to not stick to the acetate window. The tinsel glitter doesn’t stick much either but the regular glitter sure does! The snowman is popped up on foam dots so my shaker is two foam layers thick. I die cut the frame but since my dies weren’t quite the right size, I partial die cut both ends of the rectangle. It’s a great way to get more use from your dies. 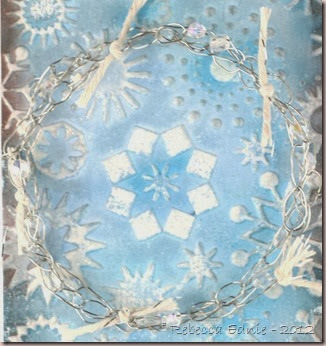 I used mirrored paper to cut the big snowflake and I used heat n stick powder to add glitter to the white one. 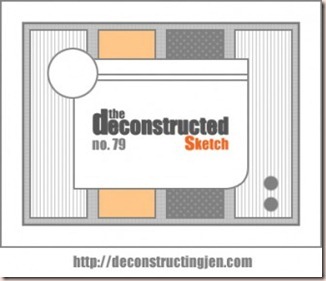 Please come and play with us at Unscripted Sketches this week! We’ve been a bit down in numbers lately so that means there’s an even better chance of your project making the top three! It’s such a good feeling to be chosen! Paper: CTMH, not quite navy-SU! 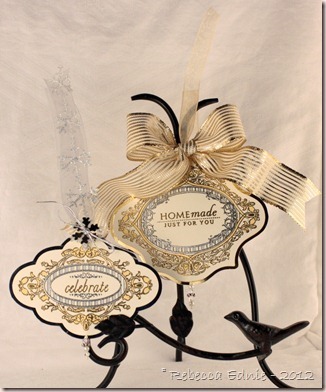 Welcome to Paper Trey Ink’s October Blog Hop. 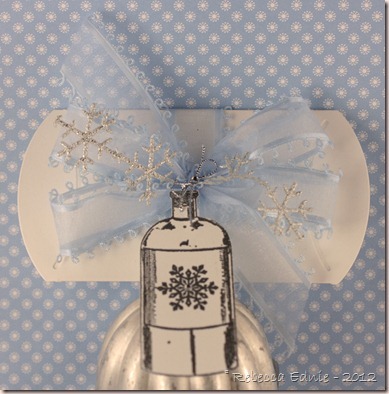 This month’s theme was to make a set of at least 5 holiday gift tags. 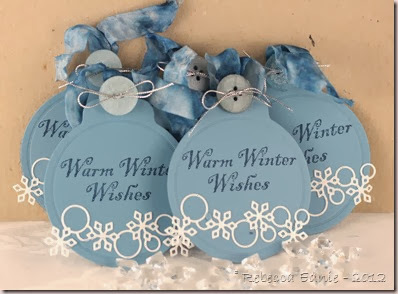 I don’t celebrate any holidays so I just made some fun winter themed tags. I dyed my own ribbon for this project. The first batch I used some reinkers that ended up splitting into too many purple tones so I redid it with only a greenish navy. That worked perfectly. Then I added some pewter Distress stain to add a metallic sheen which looks pretty IRL but is impossible to photograph and just looks white. Oh well. It’s also impossible to see the glitter I added to the snowflakes with glitter embossing powder. 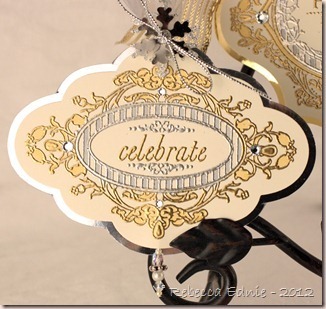 The die cut is very intricate and dainty and therefore would be hard to adhere except for a new product I used, E6000 adhesive spray. It is messy as there is lots of overspray so use scratch paper or your craft sheet and be sure to hold it in place for at least 1 minute as it isn’t very tacky at first. Other than that learning curve, it’s a great product! It also says to clean out the entire nozzle and straw after every use which is a huge pain but I’ve not done it and so far, so good! Whew! 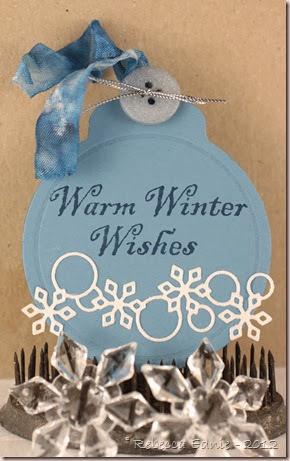 I am going to make it under the line for this challenge!Winter Home Decor Challenge in the Moxie Fab World. You have 30 minutes to play! 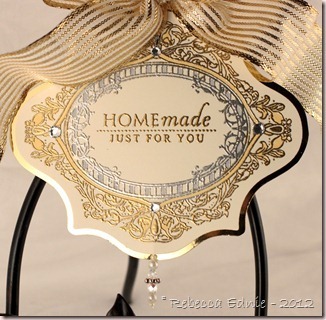 This is the simplest project ever but it is so pretty and elegant! I die cut the snowflakes from metallic paper and mulberry paper. Then I added rhinestones to some of the snowflake tips to add some sparkle. 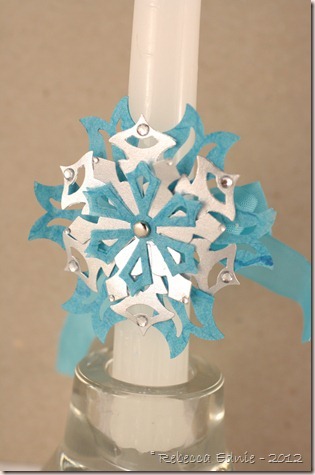 The snowflakes are held together with a brad and pressed through the ribbon and directly into the candle. As long as you don’t let the candle burn down too far, you could easily remove the snowflake and ribbon and add them to a new candle! It would be so easy to make a set as a gift or a whole table full! Sorry the candle is so crooked. I set it straight so many times! Because a candle is often seen from both sides, I tied the ribbon in a pretty double bow on the back. The dies are Spellbinders, everything else is unknown. I LOVED this week’s inspiration photo! The colours were amazing, aqua, a slightly peachy pink, silver and a bit of brown which I didn’t really use much. I decided to recreate the dress and add some silver and pink accents. There are so many details that are hard to see and so much prettier IRL. The rose on the top of the dress form is clay and from some broken jewellery my mom gave me. It had a flaw on it so I covered the petal edges in glitter. No way to see the super fine glitter in the photo. You may be able to see in the close up that I added the tiniest possible drops of Pearl Pen to the straps and neckline because to me the bodice looked beaded. The belt ‘buckle’ has tiny flowers on it. The bodice has a vellum overlay to soften it and make it match better with the colour of the skirt with the tulle over it. The mannequin is covered in pretty tone-on-tone floral paper. 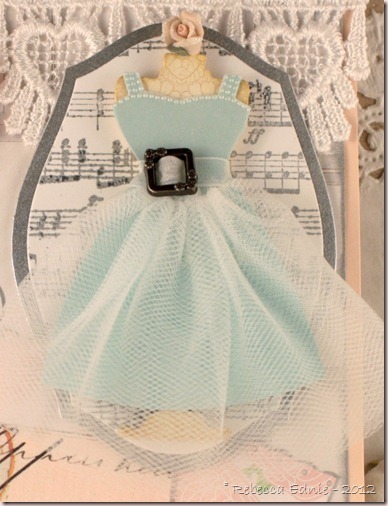 The music stamped behind the mannequin has small areas which are embossed with silver glittered embossing powder which gives it a bit of vintage, distressed looking sparkle. I really wish you could see those things. They took me ages to add! The ribbon medallion, which is mimics the one in the inspiration photo, is much pinker IRL and not so orange. More like a deeper version of the Paris postcard colour on the lower part of the card. I tried manipulating my photo every which way but it either made it worse or seriously and disastrously affected the other colours. I didn’t really use the brown much but there is a touch of it on the Paris postcard in the postmark which you can se below. This gorgeous embellishment originally had a bright pink crystal dangling at the bottom which didn’t suit at all so I swapped it out for a pearl bead. Ah, much better! Since I wasn’t hanging it from anywhere, I added a ribbon to the loop at the top. I love the subtle glitter they embedded in the epoxy when they made it. Click on either photo to visit the challenge blog posts. One other fun detail. I should have taken an angle shot because you can’t see it but the mannequin is several layers thick. She is made of pretty thick coaster board, 4 layers, so she stands out quite a bit from the background. You can tell a bit by looking at her shadow. much larger than it would be if she was flat or popped up on foam dots. I’m also entering this in the Simon Says Stamp Challenge to use Your Favourites because this music stamp is one of my favourites. I lost it for a while and was THRILLED to have found it! YEAH! These are for a couple of challenges to make tags and use neutrals. I embossed both of the medallion shapes with gold on the outer portions and silver on the inner portions. To do this, I gently poured on tiny amounts of silver EP then very quickly and carefully flipped my paper to get the powder off without getting any on the outer areas of embossing ink. Then pour gold EP on the rest of the image and heat. I was amazed how well it turned out. You can enlarge the pix below to get a better look. If you noticed, the first picture didn’t have rhinestones, I added them and took another picture. But you couldn’t see the ribbon as well so I kept the first picture I took as well. To enhance the effect of two colours of EP, I coloured some of the design in with Copic markers. I use C3 for the silver areas and Y23 for the gold areas. If you are careful to not touch the EP much, you won’t wreck your marker tip. 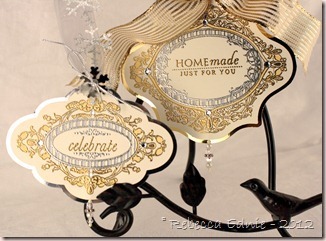 The smaller tag is backed with silver mirrored cardstock and the larger with gold. Each has a small beaded head pin dangling from the bottom. In the photo it is sandwiched between the layers of cardstock but I am considering pulling it out, making a loop at the top of the pin and attaching it with jump ring through a tiny hole in the bottom of the tag so it can swing freely. I am entering this in the Joan’s Gardens Challenge make a tag. And Simon Says ‘Anything Goes’. 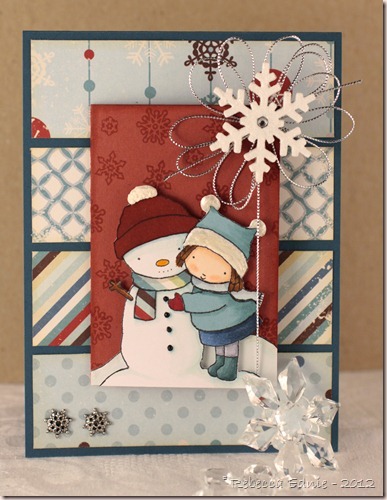 I also can enter this in the December Paper Crafts Magazine Gallery Challenge to make a holiday project. 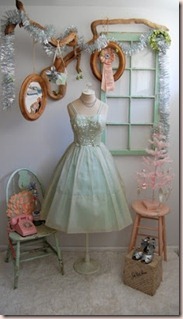 I am also entering this in the Shabby Tea Room to use the inspiration photo and use ribbon or twine and a sentiment. ETA: I am too late for TSTR. Bummer. 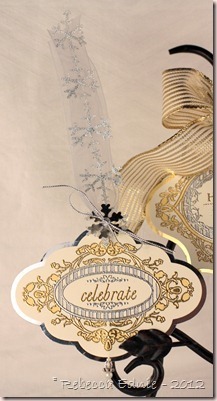 Paper: mirrored cardstock-Stamp Simply Ribbon Store, vanilla CS-SU! 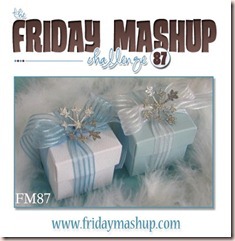 I signed up for emails from a new challenge, the Friday Mashup. They have a two part challenge. You can play one part or the other or combine them! I decided to go for both and combine that with making another project for my Swap-Bot challenge to use the stamp stamp multiple ways. Sorry for not folding the box ends together. Funny, I didn’t even think about it until I had taken the photo, mailed it and realized it looks weird in the photo! Since we all know what they look like, I know you can use your imagination! Silly me! It did help it sit up there to photograph it since it was flat. The little bottle is the same as the Vintage Parfum card, looks very different right? That was the point of that challenge, to use a stamp in lots of very different ways to get out of a rut of always using it in the same or similar ways. I thought it made a great tag. 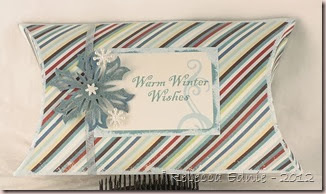 The box is great for gifts or gift cards. 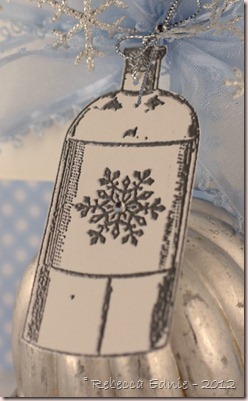 It’s hard to see but the silver bow has a tiny rhinestone in the center and so does the snowflake on the bottle. 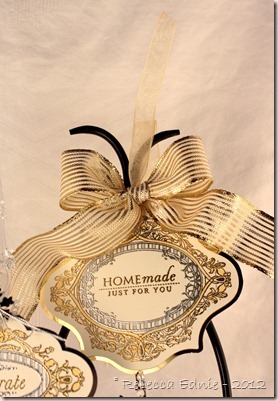 Can you see the loops on the ribbon edges? It is formed from a looped cord attached to a tiny satin edge, so much classier than the old picoted ribbon I used to use in the late 80’s on country wreaths! Click on the photo to visit the challenge post. I’m also entering this in the Simon Says Stamp ‘Anything Goes’ Challenge. 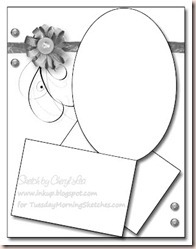 As soon as I saw this sketch, I thought of adding a gift card pocket to the front of the card. And I had paper that was perfect! 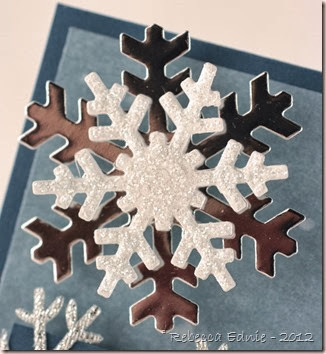 The snowflake is made from 5 or 6 layers of cardstock glued together. 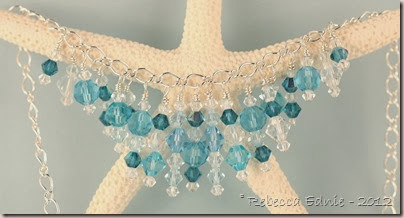 It makes for quite a nice sturdy embellishment! In the center is glued a perfectly matched rhinestone! I know red is an odd choice for a background for a snowy scene but it popped much better than any of the aquas or blues in the paper. Brown was out and so was pure white so red it was! Here you can see the inside of the pocket a bit. It is a simple folded cardstock piece with a small flap that folds up from the bottom to secure the card and it adhered on one side only. Let me know if you’d like the pattern. I trimmed the pocket a bit so the cover closes well and rounded the inside left corner. 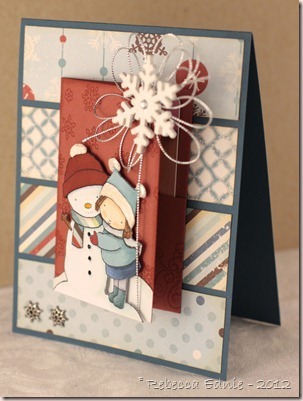 It is stamped with snowy flourishes. The metal snowflake accents? They are bead caps I wasn’t using because they weren’t working with my jewellery style. Too pointy and big. But flattened out, they make perfect snowflake accents! I added a few fun textural touches to this little scene. Nuts, I just noticed that the silver cord is over the scarf and pompom on the hat. Oops! It just needs to be slipped back underneath! 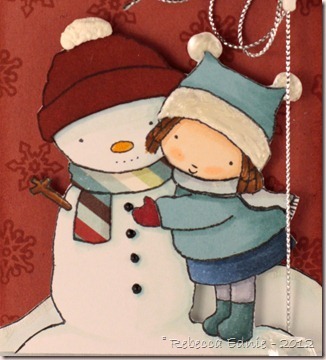 The snowman is sporting Liquid Applique on his hat and the little girl has Pearl Pen added to her hat. The hats, scarves and coat are paper pieced. The buttons are dotted with Enamel Accents to make them raised and shiny. The snowman nose and the hill behind the scene, which I hand drew, are accented with Crackle Effects to make them look like they are covered in cracked ice. Lastly, the scene and the paper piecing are coloured and shaded with Copics. Oh, and the colour of the snowman hat is deepened with Distress ink. 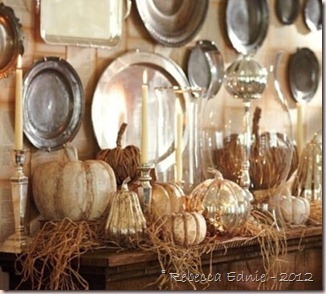 I had so much fun coming up with ways to enhance this cute little scene! Click the sketch to visit the blog post. Since this layout comes up over and over, I’m making a note that will help me and maybe you too. If your card is 4.25 x 5.5” and you want 1/8” borders and spaces between the panels, each one needs to measure 4” x just under 1 1/4” wide. 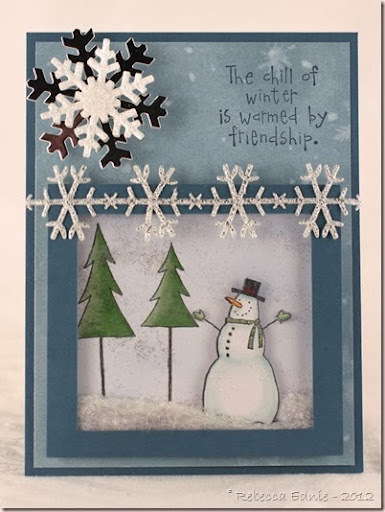 I’m also entering this in the Simon Says Stamp Challenge ‘Anything Goes’ and the Cute Card Thursday challenge 245 to use snowflakes. Paper: DP-Echo Park, white CS-Taylored Expressions, Navy, red CS-SU!